I have seen many parents on baby name forums who have a great appreciation for classic literature, so much so that they are determined to use the names of their favorite characters in their child's name. I admire their devotion and envy their knowledge of these characters. 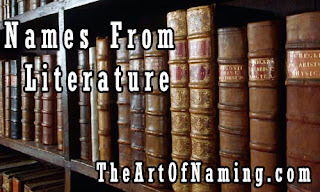 Of course, the term "literature" covers a grand spectrum of novels. Most of these names come from the classic masterpieces that have touched the hearts of readers for decades. While I cannot possibly list every name of every character in every book ever written, this is definitely a pretty good list to start with if you're in need of a literary moniker. Below this list, I have handpicked my favorites that I think would be very handsome for a modern day boy. Then I went one step further and paired them with a couple middle name ideas and listed a few potential sibling name ideas to help you decide if you'd truly want to consider adding said names to your short-list. After all, that's the whole point of a list like this: to help you find the perfect name for your child! Please feel free to join in on the fun and choose your favorite names from the list! You can share them in the comments below! Let me know which middle name options you would pair with your favorites! Also, if there are any names that are not on this list that you think deserve to be, list them in the comments and I'll surely add them in! Enjoy! Keep in mind that since I'm not incredibly well-read, I do not know how dastardly, devious and despicable some of these characters could be. Always do your own research on a name before you commit to it, even if it isn't linked to literature. Make sure that all popular namesakes are those that you can live with. You and your child might be asked if the name came from this book or that TV show or whatever for the rest of your child's life. It isn't necessarily a bad thing, just something to consider! Don't forget to check out the list of Girl Names from Literature too! That's my Top 10!! Which names are your favorites? Unusual and Quirky Middle Names for Boys! What is Your Favorite Max Name?